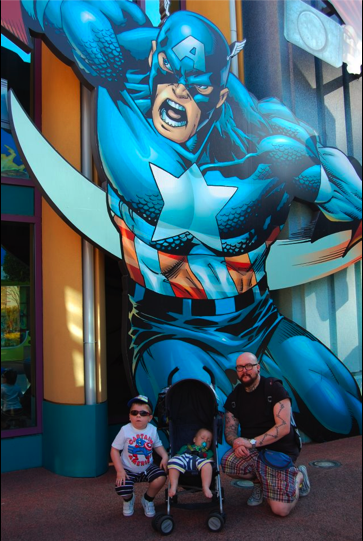 Gifts from the Pirates: Orlando Islands of Adventure : Super Hero Island : Marvel Meeting Spiderman, Captain America, Doctor Doom. Orlando Islands of Adventure : Super Hero Island : Marvel Meeting Spiderman, Captain America, Doctor Doom. I haven't written about our holiday to Orlando, Florida since we got back as so many amazing things happened and there were so many photo's for me to go through, I could have posted hundreds. 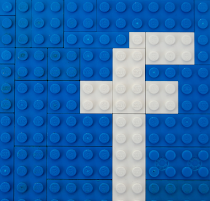 I've decided it would be easier if i broke it up into separate posts. 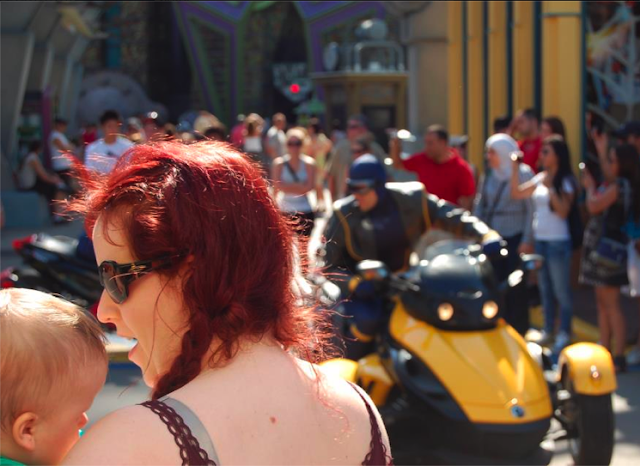 From the moment we booked the holiday with Virgin Holidays it was all about Islands of adventure for me. 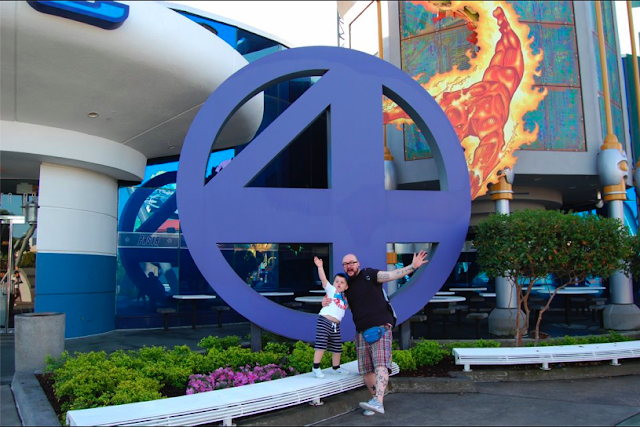 I've wanted to go for such a long time, because I had read online, and googled it for so many years, meeting the characters, villains and superheroes, the rides, the character parade, the super hero themed resturants, I couldn't wait to go, and share it with our two super hero crazy boys! But our eldest like me, was in his element. There was so many great things to photograph which i loved as the one thing i really wanted from the holiday was a great collection of family photo's. The staff are so friendly, and will take photos for you, just about anywhere in the parks, and also in the stores where you meet Spiderman and the other characters. After meeting spidey we stepped outside and was greeted by a not so friendly villain from the world of Marvel.... the two of them showed off in true super hero style! 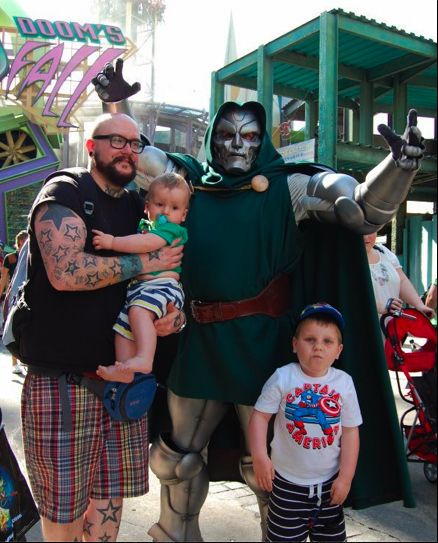 I was shocked our son wanted to go near him as we saw the Green Goblin before Dr Doom and he didn't want to go over to him as he was so realistic, and even adults looked alittle weary! Again, Dr Doom stood, posed and spoke to us like he had all the time in the world for us. It was great to see that Mrs M was really enjoying herself too but then she will always have a smile on her face if she knows her boys are happy. The range of rides were really good too , they were well designed to suit all ages. Seth and I loved the Spiderman ride, but didn't realise you needed to grab 3D glasses at first, so be sure to pick a pair up at the entrance. If you want to get on all the rides without standing in line for a long time, as these rides are so popular, I'd suggest getting to the park when it opens, and heading straight to the Marvel land, which is found by walking straight through the gates at the entrance and bearing left, (walking over the Hulk roller coaster goes over the top of that! ) and you're there! The Hulk coaster was amazing, and as it goes so quick, you don't have to stand in line too long to experience it. The only thing I would change at Islands of Adventure would be the shops. There was lots of things to buy but there wasn't a great choice of hard to find figures (i was hoping to be going back to the hotel with bags full). I didn't think there was much there that you couldn't go and purchase in the UK from Forbidden Planet or Nostelgia and Comics. We still ended up spending around $200 on really cool t-shirts, baby clothes, personalised mugs, some figures, and a really cool caps, postcards, stationary and books. The prices in the stores were so reasonable, and you get alot for your $ really. The life size statues of the characters where amazing, I would love one for the house, it would definitely be a talking point. Sadly we wouldn't have the room and I'm sure Mrs M would have something to say about a life size Spiderman hanging from the ceiling. In one of the shops there was a glass cabinet full of Marvel guitars which were amazing, sadly it was really difficult to get a decent photo because of the lights and glass. They were reasonably priced too, if I had been musical I probably would have bought one. 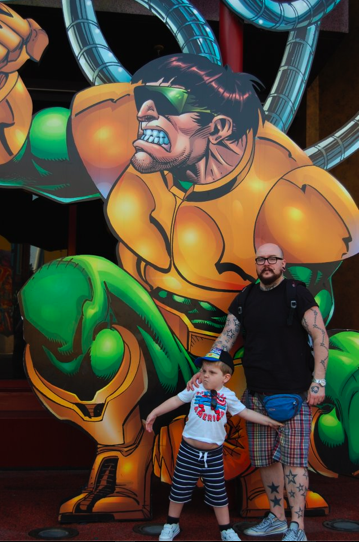 We all had an amazing time at Islands of Adventure, and can't wait to go back again although there is a possibility Mrs M spend a fortune as Opeie will be alot more knowing about Marvel, and want so many more things! It really was such a fun day, and we ended up going back 3 other times, using our FlexTickets which made the park hopping so inexpensive, compared to buying day tickets on the gate. We also had breakfast with Spiderman, Thing 1 & Thing 2, and Cat in the Hat, which you can read about here. Above: The VW Hulk car. It was so cool, and the boys would love to be driven around in this! wow. are you planning to go back or to Megacon? Looks like you had a blast! I love reading about holidays to Orlando, but never been, your post has sent me over the edge with excitement, just ordered some Virgin brochures to book it!!!!!!!! SOOOO EXCITED!!!!!!!!! Looks like you had soooo much fun!!! !